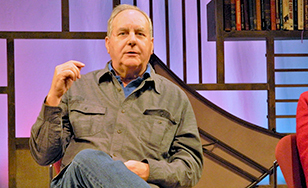 What are the odds two world-class playwrights would be in Duluth at the same time? Astronomical, probably. But the stars aligned recently for the local theater community. In February, the University of Minnesota - Duluth staged a production of "These Shining Lives" by Melanie Marnich. At the same time, St. Scholastica Theatre coincidentally produced "Eleemosynary," written by Marnich's spouse, Lee Blessing. When UMD invited Marnich to Duluth to workshop the play, Blessing decided to tag along, as they live in Los Angeles but are both Minnesota natives. At the time, Blessing had no idea St. Scholastica would be running one of his plays. When he found out, he added St. Scholastica to his already busy week, taking part in a dinner, a workshop with the cast, a class on character creation and development, which was available to all St. Scholastica students, and a question-and-answer session after one of the performances of the play. "It just kind of came together, and it's great," said director Merry Renn Vaughan. The Q&A session was well attended by CSS and UMD students as well as community members. Blessing, whose play "A Walk In The Woods" was nominated for both the Tony Award and the Pulitzer Prize, cracked up the crowd with his humor. Afterward he and his wife were presented with St. Scholastica and UMD apparel to sport back in LA.